One has to asked the question, does Michael Phelps stand for the greatest athlete of all time award? There are many who would argue that yes, he would. Others would say that swimming is not a sport, and still others who say an individual sport doesn’t count when compared to baseball, football, etc. He certainly carries the work ethic – 4-5 hours a day in practice, 10,000 calories a day for food, etc. The other element that makes Phelps different is there are only 2 competitions that really count, the World Championships, and the Olympics. Phelps doesn’t have any room for error, and he has exerted his dominance over the rest of the swimmers. Beyond that, there is a human element to his greatness: he is poised and appears humble. Phelps doesn’t look like anything special. Pass him on the street, and you may think he is a computer programmer or a member of the geek squad at Best Buy. Who would’ve thought that underneath Phelp’s shell there is a champion? All of the eyes will be on him tomorrow as he goes for the record. If he doens’t get it, he still has the thrill of tying a record for one olympics, and having the record for most individual medals overall in the Olympics. Enjoy tomorrow’s race, as Phelps attempts history. 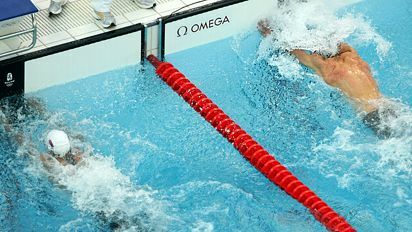 This entry was posted on August 16, 2008 at 12:36 am and is filed under 2008 Summer Olympics with tags Mark Spitzer, Michael Phelps, Michael Phelps wins 7th Gold medal, Phelps breaks history, Phelps Gold Medal times, Phelps official results, Phelps official times. You can follow any responses to this entry through the RSS 2.0 feed. You can leave a response, or trackback from your own site. It is true all eyes will be on Phelps, and so will mine. But the greatest athlete all time? Its hard but I don’t think its him. What do you guys think? That’s a good question. I heard Jeremy Schaap give a good response to that in a radio segment. He basically said that while there’s no doubt Phelps is one of the greats, it’s impossible to crown one person the greatest Olympian or athlete of all time. One of the reasons is that Phelps has benefited from being in a sport with numerous events. But there are many athletes whose sports only have one or two events during the Olympics. It’s impossible for them to win as many gold medals, but does that mean they’re not as good of an athlete? I think Michael Phelps truly is one of the greatest of all time. He’s dominated his sport and many times he’s making it look almost easy. But because of the diversity amongst the various sports, I don’t think it’s possible to say that he, or anyone else for that matter, is absolutely the greatest.